I’m deeply in love with history right now (and especially American history) due to my reading of the Hamilton biography. It’s over 800 pages, but worth it. One of the things it has me thinking about is the disagreement between Hamilton and Jefferson about how to run a government, and a nation. In general, Hamilton was for a strong central government, a strong military, and big cities. Jefferson was all about strong state governments, less focus on military, and focus on rural areas. That’s an oversimplification of course, but they’re some of the key points. What strikes me is that the question shouldn’t be which is right and which is wrong. I think the genius is that we have two very powerful models to work with in the first place. That’s progress enough. No, I think the question is instead when to use which of the two. I feel like there are phases and maturity levels for civilizations, and governments, and populations—and at any given time that group might need one while it will need a different one later. My non-expert impression of this is that Hamilton is more right while there is youth and chaos, and that Jefferson is more right when there is maturity and wisdom. In short, the more maturity you have, the more individuality and freedom should come with that. And the more raving and frothing you are, the more limitations you need in order to keep from harming yourself and others. I think the parent and child metaphor works well here, although Jeffersonians will balk at it. “You’ll not treat me like a child!”, they’ll say. Well, children need to be treated like children. Not because they’re inferior, but because we know they will eventually be equals and we want to see them make it to that age. So if you want to see them survive you have to place some limitations on behavior. The trick is knowing when it’s time to remove those boundaries and enable full freedom, and the fear is that this is hard to do once the freedoms have been curtailed. I think it’s possible, though, and even more than possible—it’s essential. It seems like there’s a natural progression we can witness. At the earliest stage it’s all about freedom, because there’s no government to speak of. Then there’s force-based control in small groups, like warring tribes. Then there’s a dictatorship-type situation. Then there’s an offshoot Jeffersonian government that goes rogue. Then there’s a strong, central, Hamiltonian democracy. Then, finally, once we’re all sorted out, we can get back to a Jeffersonian model of individual and local freedoms trumping the central authority (because they’ll largely be in sync). I’m sure someone who’s read more about this can show me 114 books on this topic that cover it much better than I just did, and I’d like to read them. So if you’re one of those people, let me know. 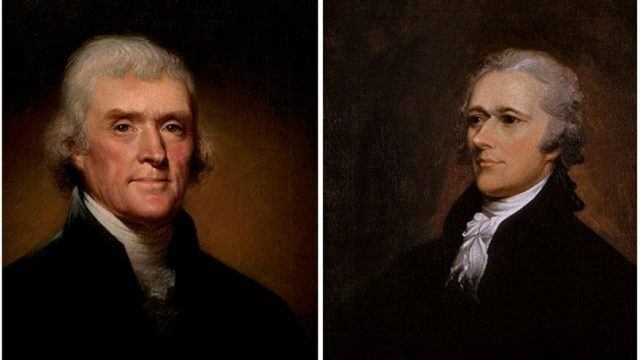 I just find the Hamilton vs. Jefferson thing to be a false dichotomy. People need different types of government at different times, based on their maturity. I never liked history as a kid, and I do blame my teachers in elementary school. Teaching without passion should be a crime punishable by unemployment.